As the internship coordinator here at CurrentMarketing, I get to meet lots of enthusiastic young professionals eager to work at an advertising agency. I often get asked about the typical day at an ad agency. They want to know what being in an agency environment is like as well as the expectations that come with the territory. Thinking back to my days in ad school, I had many of the same concerns. I worried about the unspoken dos and donts of working in this business. College gave me the knowledge, but not the context of its application. That is why I decide to write a short field manual for young advertising professionals. See what made my list below and feel free to add your own advice to young advertising professionals in the comments section. Please note this list is based on my experiences and is no way intended to be exhaustive. After all, I’m still sort of a newbie myself. 1. Get a smartphone and take it everywhere. You never know when you might be needed during an advertising emergency. 2. Go to as many meetings as possible. The more you know about clients and processes, the better you will perform in your role at the agency. Most importantly, listen before speaking. 3. Dress above your pay grade. The right attire conveys confidence and demands respect. As the newbie, you want to be taken seriously, so be sure to dress the part. As a start, never wear jeans in front of clients and leave the t-shirts at home. 4. Learn to network. Advertising is all about who you know. As a newbie, you’ll be meeting lots of new people from coworkers to clients. That means it’s time to brush up on your interpersonal communication skills. Most importantly, remember you are now a representative of the agency at all hours of the day. You never know who might be watching, so act accordingly. 5. Be early, stay late. This applies to everything. From client meetings to the cocktail hour. The be early, stay late principle conveys dedication. The hour prior to and after the traditional work day are the most productive and without distraction. Be sure to turn all your work in early and offer to stay late to help others. You are now apart of a team, so do your part to show everyone that you are on board. 6. Be patient. 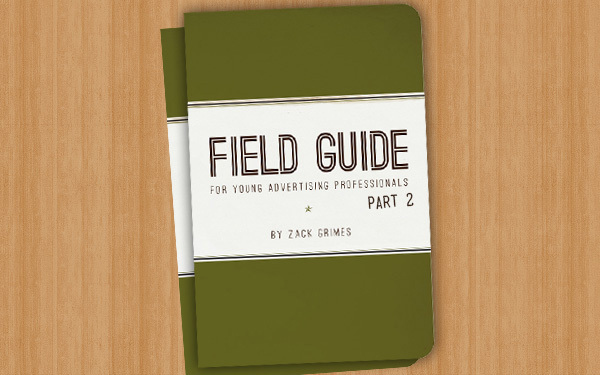 This is the toughest skill to master as a young advertising professional. Things will go wrong and you will make mistakes, but remaining patient through these tough times will help propel you up the corporate ladder. Once the honeymoon period in your new job ends, you will feel the urge to complain. Instead, be patient and focus on the now. Control your environment and do the best you can in your role each day. The key to happiness in this industry is patience.